OVERVIEW: Golden Globe® winner Colin Farrell (2009, Best Actor, In Bruges) and Noomi Rapace (Prometheus, original The Girl With The Dragon Tattoo) are out for revenge in the intense action thriller DEAD MAN DOWN, available July 9th on Blu-ray™ Combo Pack and DVD with UltraViolet™ from Sony Pictures Home Entertainment. Niels Arden Oplev, director of the original Swedish-language The Girl With The Dragon Tattoo, reunites with Rapace for this suspenseful tale of two strangers irresistibly drawn to one another by their mutual desire for revenge. The top-notch cast also includes Dominic Cooper (Captain America: The First Avenger) and Academy Award® nominee Terrence Howard (2006, Best Actor, Hustle & Flow). 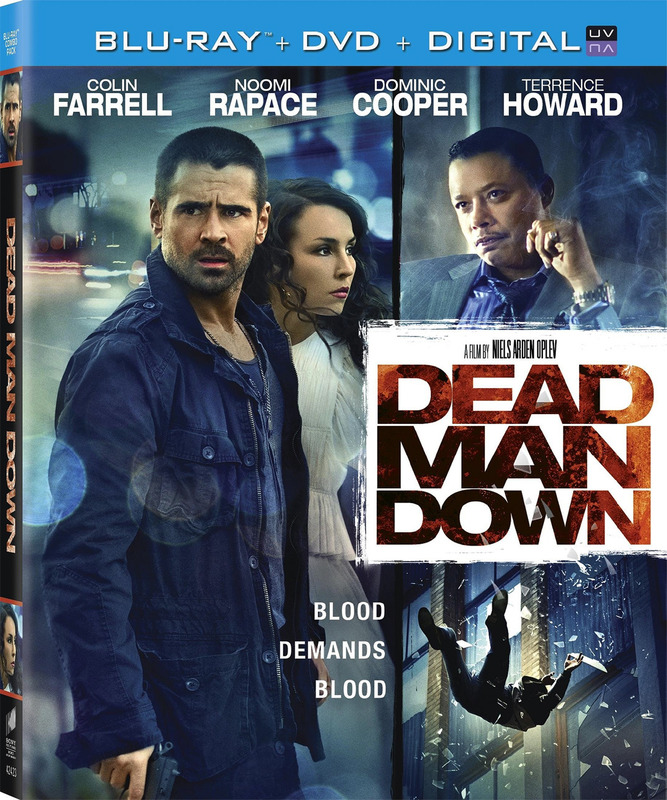 The DEAD MAN DOWN Blu-ray Combo Pack includes three all-new featurettes, taking viewers behind the scenes for an inside look at the intricate work that went into making the film, including the choreography behind the gunfights, as well as the unique look and dark aesthetic used by filmmakers to enhance the story. SYNOPSIS: Victor (Farrell), a professional killer and the right hand man to an underground crime lord in New York City, is seduced and blackmailed by Beatrice (Rapace), a crime victim seeking retribution. Their chemistry and intense relationship leads them to execute a violent and cathartic plan for revenge. Firefight Choreography: Staging the Gunfights of Dead Man Down -- An inside look at the choreography behind the gunfights in the film. Revenge Technique: The Cinematography of Dead Man Down -- Details the unique look and dark aesthetic used by the filmmakers to enhance the story. Revenge, Redemption, and The Art of Filming Dead Man Down – The ensemble cast discusses the intricate behind-the-scenes work that went into the film.